New research released by Microsoft on Tuesday dives into raging debate of whether social tools like Twitter, Microsoft Lync, and Facebook belong in the business realm. Do they enable employees to become more productive, or are they distractions that should be limited in the workplace? The answer, it seems, depends on what country you work in. A worldwide survey of 9,900 workers conducted by Ipsos on behalf of Microsoft found that workers in China, India, Turkey, and Mexico reported the most productivity gains from using social tools, on the average of from 67 percent to 84 percent of those polled. U.S. workers took a much more conservative view, however, with only about a third saying that they were more productive when using social tools. The U.S. was also among the 23 countries out of 32 that cited security concerns as a reason for restricting social tools in the workplace. 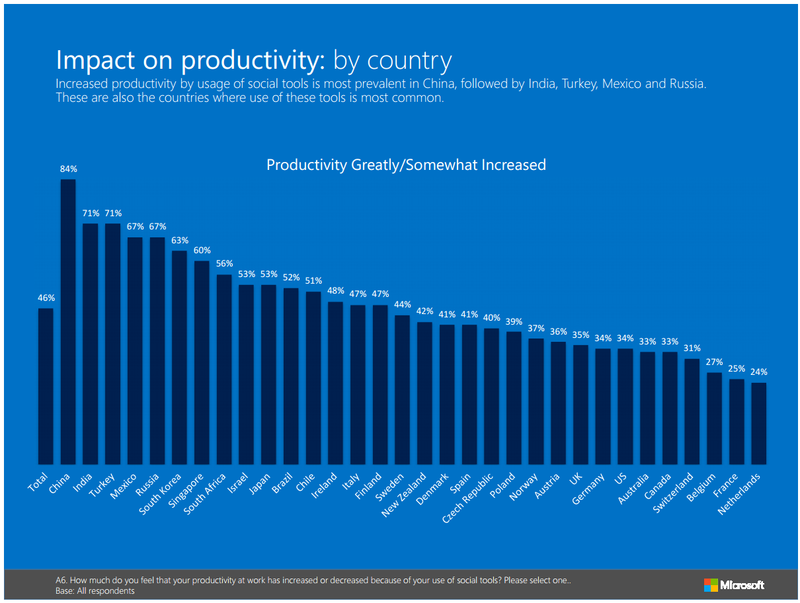 Within the remaining nine countries, employers restricted social tools because productivity actually dipped, the survey said. Most social networks lie outside of Microsoft's domain, with Facebook, Twitter, and others driving conversations around the globe. In the last few years, however, Microsoft has begun injecting itself into those conversations by aggressively integrating social networks like Facebook into the body of information its Bing search engine searches, and forging ties to LinkedIn, foursquare, Quora, and Klout. (Microsoft also has its own social experiment, so.cl.) Meanwhile, Microsoft bought Yammer for $1.2 billion last year, and recently said that sales at the collaboration software maker are booming. Microsoft has also added additional pieces, such as voice, video, and text chat provider Skype, tying them to its in-house collaboration engine for businesses, Lync. Overall, Microsoft said that the survey indicated that workers wanted to use social tools at work, with a third even going so far to say that they would pay for their own social tools — even though the most popular ones are free. About 77 percent of those polled said that those tools make them feel more productive, with about 40 percent saying that the tools had contributed to collaboration among colleagues within the workplace. That's not to say that employers have wholeheartedly embraced social tools, however. Within the United States, for example, 55 percent of those polled said that social tools are a "distraction" in the workplace, and and 49 percent said that they believed that management looked upon social networks as an intentional or unintentional way to leak sensitive company information. Microsoft published a summary of its findings on its Web site. Do social tools help or hinder your business? Let us know in the comments.